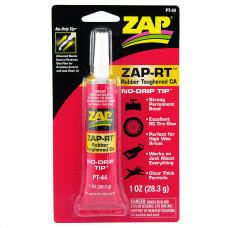 ZAP-RT (Rubber Toughened) is our newest glue product, offered with our revolutionary, patented, No-Drip Tip. Formulated for numerous hobby and craft applications in R/C Airplanes, Cars and Boats, wood, plastic, composites, rubber, etc. 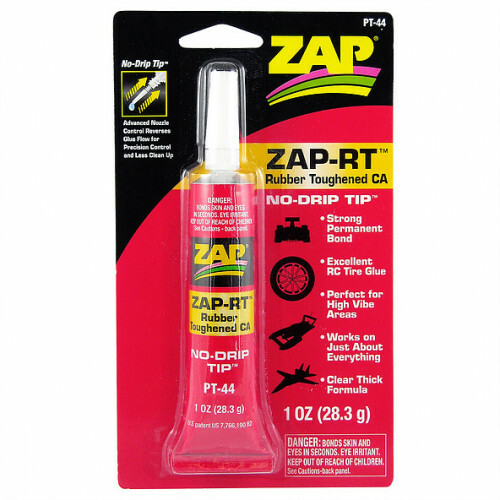 ZAP-RT is extremely strong and flexible and coincidentally is perhaps the very best R/C Tire Glue on the market today. The clear formula will not mar chrome R/C tire rims.